Journalist, politician, Lieutenant-Governor of Manitoba (1877-1882). Born on 31 December 1816, at St. Roch, Lower Canada. He was the son of Joseph Ange Cauchon and Marguerite Vallee. He was educated at the Quebec Seminary. He was married three times: first in 1843 to Julie, eldest daughter of Charles Lemieux of Quebec; in 1866 to Marie, daughter of Martin Nolan of Quebec; and on February 1, 1880 to Emma, daughter of Robert Le Moine, Clerk of the Senate. In 1841-42 he replaced Etienne Parent temporarily as editor of Le Canadien, and in the latter year founded Le Journal de Quebec, which he edited until 1874. He studied law with James G. Baird and was called to the Bar of Lower Canada in 1843 but did not practise. He was president of the St. Jean Baptiste Société of Quebec. 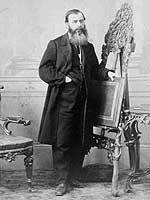 Cauchon was Lieutenant-Colonel of the 9th Battalion of Volunteer Militia, or Chasseurs de Quebec; and was Mayor of Quebec for some years. He was one of the chief promoters of the North Shore Railway and St. Maurice Navigation Company, and its president from its organization up to 1872. He declined the Assistant Provincial Secretaryship for Lower Canada (with a seat in parliament) in 1851. On the reorganization of the McNab-Morin government he became Commissioner of Crown Lands in January 1855, but resigned in April 1857. In 1857 he was appointed chairman of a committee to gather information in regard to the quantity of tillable land in the North-West, routes of access, and the claims of Canada to a portion of the country. In the Cartier-Macdonald government, he held the post of Commissioner of Public Works from June 1861 to May 1862. In 1867 he was called upon to form a government for the Province of Quebec, a duty he failed to accomplish, owing to causes beyond his control. He supported Confederation and was the first Speaker of the Canadian Senate from 5 November 1867 until 26 July 1872, when he resigned this post and his seat in the Senate, and was elected to the House of Commons for Quebec Centre as an Independent. Charges of political corruption were brought against him, and he resigned from the legislature on 11 December 1872. He was re-elected, and Alexander Mackenzie, whom he had been supporting in the House of Commons, included him in the federal cabinet as President of the Council, 1875. In June 1877, he was transferred to the Department of Internal Revenue. In October 1877, he was appointed Lieutenant-Governor of Manitoba. His last official act was the dissolving of the legislature by proclamation on 6 December 1882. He died at Whitewood, near Qu’Appelle, North West Territories, on 23 February 1885. He is commemorated by Cauchon Street in Winnipeg. Joseph-Édouard Cauchon, Dictionary of Canadian Biography XI,159-65.